The success to date of Williams Landing has prompted developer Cedar Woods to move ahead with a number of new developments. On the back of attracting Target Australia and and the Minister for Finance's office to one of Melbourne’s fastest growing commercial precincts, images have been released of the tallest commercial development planned thus far for the suburb, spanning 10 levels. 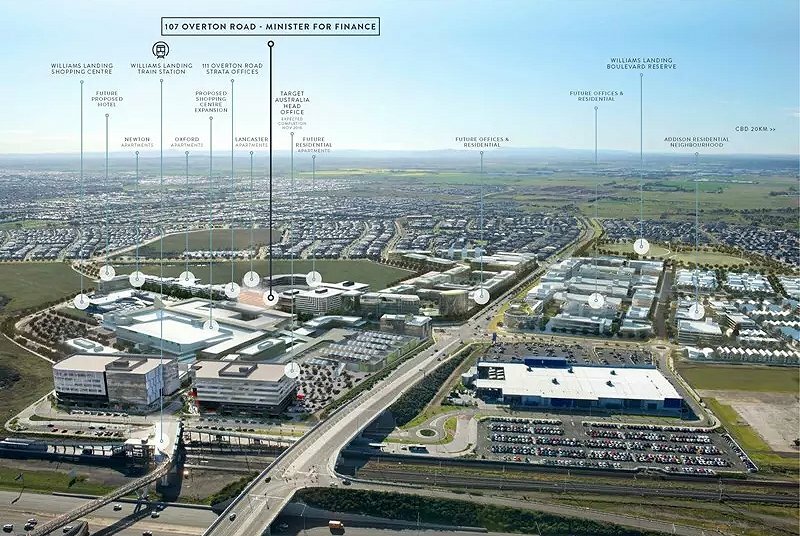 It along with an adjoining new commercial office building form the basis of Cedar Woods' next attempt to attract a major tenant to the suburb which is midway between Melbourne's CBD and Geelong. Agents Colliers International & Knight Frank have been appointed to market the new space designed by Gray Puksand with up to 20,000 square metres available. The updated Williams Landing master plan includes the new home of the Minister of Finance. The new four-level A-grade office building is located at 107 Overton Road, with Cedar Woods successfully leasing the asset to the State Government agency for 15 years. Completion is expected during July 2019, although earlier this year Cedar Woods chose to sell the building via an expressions of interest campaign handled by selling agent CBRE. 107 Overton Road includes in excess of 3,000 square metres of office space and 92 vehicle bays, and is reflective of the impetus Williams Landing has managed to muster since its inception. Ultimately it's expected that Williams Landing will cater for a workforce in excess of 23,000 people, whilst also accommodating thousands of apartments and a proposed hotel which is slated for the southern-most plot within the suburb. The move to realise more projects within Williams Landing is in part due to the success of current projects that are at construction nearby. Hacer has a trio of projects at construction; most notable is the Gray Puksand-designed Target Australia headquarters which spans 8 levels, whilst a side by side build will also see further office space and apartments delivered by the builder. One aspect of the dual site includes a 5 level strata office building including 39 suites, with the adjoining building a 7 level apartment building which encompasses 42 dwellings. Dubbed Lancaster Apartments, the project was 100% sold prior to commencement. Also due for completion in August are Oxford Apartments. Builder Figurehead has been tasked with the $23 million delivery of 100 apartments and 3 retail tenancies within the projects which is located at 2 Clark Street, Williams Landing. Figurehead completed the initial apartment offering within Williams Landing. The DKO Architecture-designed Newton Apartments were completed during April 2017 and includes 57 apartments. What is being developed on the former Masters site - there is no news anywhere what is coming? no news for the Masters site, no news for town centre.